Eyes on Odyssey and Zelda again. Hey, issue #125 of Switch Weekly here, with your round-up of Nintendo news. I picked up 'Ape Out' a few weeks ago, and have been putting a little more time into it over the past few days, and I'm having a blast with it. If you're unaware it's a top-down beat 'em up in which you play a gorilla on the escape from capture. But it's the games stylized visuals and jazz soundtrack that really elevate it. It's super intense and you should definitely check it out. Other than Nintendo announcing Mario and Zelda getting VR modes, it's been a somewhat quiet week. The VR thing is interesting, but judging from the artwork above, holding the Switch against your face like that isn't going to suit long play sessions at all. Anyway, all the usual links and upcoming games are listed below. Labo VR support coming to Mario Odyssey and Breath of the Wild — Mario is getting a few challenges added, whereas you can seemingly play the entirety of Zelda in this new VR mode. I was intrigued by the VR kit before, but this tipped me over into pre-ordering. Labo VR is out on Friday next week, and these free updates will be available a few weeks later on the 25th. ▶ How Cuphead's devs gambled on a dream — This 20-minute making of video is over a year old now, but is really worth a watch if you're curious about the upcoming Switch release. The two brothers behind the hit game explain how it came to be — it's a real labour of love. Punch-Out!! and Super Mario Bros: The Lost Levels join Switch’s NES titles in April — Both are fairly tough games, so if you like a challenge be sure to open up the NES app on April 10th. REVIEW Mechstermination Force — "the best 2D boss rush game on Switch"
REVIEW Darksiders: Warmastered Edition — "no slouch on the Switch"
PDP unveiled a new controller for the Switch this week. It's unique in that unlike the official Pro Controller it has a functioning headphone jack. This means you'll be able to play games like Fortnite, docked, and still have working voice chat. No word on price yet, but the 'Faceoff Deluxe+ Audio Wired Controller' is due out this summer. All releases are EU & US unless otherwise stated. Jungle Z — Doomsday zombie survival. Phoenix Wright: Ace Attorney Trilogy — I'd love to replay this. Think I'll wait for a sale. Out There: Ω The Alliance — Space exploration with comic strip vibes. Cook, Serve, Delicious 2 — Restaurant sim. Switch 'N' Shoot — One button arcade shooter. The Mystery of Woolley Mountain — A comedic 'otherworldly' adventure. Box Align — Budget puzzler. Shadowgate — New console version of this classic adventure. Back to Bed — Surrealist puzzles with a total M.C. Escher vibe. Vaporum — Steampunk dungeon crawler. The Demon Crystal — 1984 action RPG. Way of the Passive Fist — 2D brawler. Super Star Path — Color match puzzler with shoot 'em up elements. Reigns: Game of Thrones — A timely release. Bot Vice — Gallery shooter. Hellblade: Senua's Sacrifice — Ninja Theory's action adventure lands on Switch. Doggie Ninja The Golden Mission — Four player party game. Street Basketball — One on one basketball. Rolling Sky — Looks like an endless runner of sorts. Mobile port. Nintendo Labo Toy-Con 04 VR Kit — Cardboard, for your face! 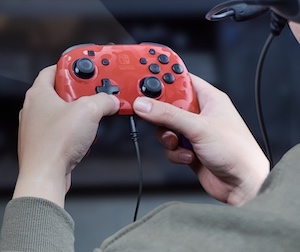 🎮 More fake Joy-Cons — these ones are curvy. ⬇️ No cart in the retail version of Wolfenstein: Youngblood? May be download code only. ☁️ Civ VI now supports cross-platform cloud saves. 😬 Nintendo (and Sony and Microsoft) are under investigation for 'unfair' online subs. ⚔️ Hellblade is landing on Switch next week. 🏆 Labo took home two awards at the recent game BAFTAs. 🔧 This Redditor took apart their Joy-Con to figure out why it was drifting.